It was 10 nights before Christmas, and all the way down Wall Street the coast was clear. A flatbed truck turned the corner and lurched to a stop in front of the New York Stock Exchange. Arturo Di Modica and his small band of co-conspirators jumped out and quickly got to work. The night watchman had just completed his patrol of 11 Wall St., and, having cased the block for several nights, Mr. Di Modica and his team knew they had just 4½ minutes until he returned. They lowered the bronze statue—all 3½ tons of it—onto the middle of Broad Street, right under the exchange’s Christmas tree. The truck zoomed out of sight, but Mr. Di Modica stood at the corner, watching and waiting for morning. It was 25 years ago that Wall Street’s favorite mascot arrived downtown. Mr. Di Modica, the Italian artist who says he spent $350,000 of his own money to cast “Charging Bull” in his SoHo studio as a Christmas gift to the city, relished the reactions of New Yorkers—traders, tourists, cabdrivers and hot-dog vendors. Executives at the New York Stock Exchange weren’t nearly as amused. The police were called in, and when they proved unwilling or ill-equipped to run an 18-foot-long bull out of town, the exchange hired private contractors to haul the beast off to Queens. Mr. Di Modica, who for years plopped his works onto city streets in the middle of the night, should have been used to this sort of thing. But even though his bull seemed menacing—nostrils flared and ready to gore anything in its path—the sculpture, he said, was intended as a symbol of New York’s drive, optimism and willingness to barrel ahead against the odds. 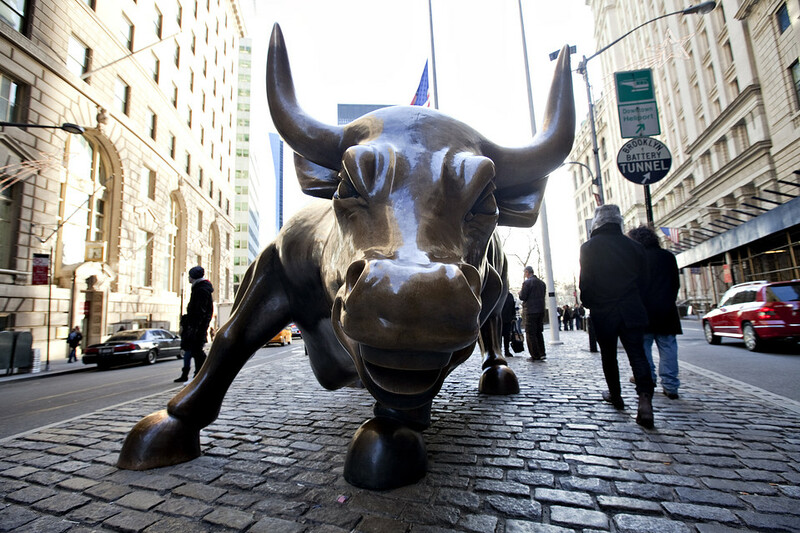 The artist conceived “Charging Bull” during the city’s most bearish hour, just days after the stock-market crash on Oct. 19, 1987, known as Black Monday. Mr. Di Modica, a Sicilian immigrant who had found success in New York—enough to buy a Manhattan studio and a Ferrari—remained hopeful for his adopted home at a time many were convinced the city’s best days were behind it. Though the market had recovered much of its losses by 1989, the city was still a crime-ridden shadow of its former self. Mr. Grasso, recalled Mr. Di Modica, hung up. Mr. Di Modica paid to bail “Charging Bull” out of Queens, and with the help of community activists and the city’s Parks Department found a new home for him just a few blocks away from the exchange in Bowling Green. There he has remained for 25 years, through bullish and bearish times alike. He has witnessed the drop in crime, the rise in real-estate prices and the election of a billionaire mayor. He has also stood firm through the dot-com bust, two terrorist attacks—Sept. 11 left him covered in a thick layer of soot—the worst economic collapse since the Great Depression and the Occupy Wall Street protests. Mr. Di Modica has likely recouped the expense of building the bull several times over in the past 25 years, having cast sibling bulls for cities around the world, and having sold many smaller versions to collectors. Richard Grasso was president and chief operating officer of the New York Stock Exchange 25 years ago. An earlier version of this article incorrectly described him as the NYSE chairman at that time. Did you know that there are over 150 components to every utlility bill?